, an eminent Italian artist, and one of the earliest scholars that appeared in the revival of letters, was of a noble and very ancient family at Florence, but was born at Venice in the end of the fourteenth, or beginning of the fifteenth century. Various authors have given 1398, 1400, and 1404, as the date of his birth. In his youth he was remarkable for his agility, strength, and skill in bodily exercises, and an unquenchable thirst of knowledge possessed him from his earliest years. In the learned languages he made a speedy and uncommon proficiency. At the age of twenty, he first distinguished himself by his Latin comedy entitled “Philodoxius,” copies of which he distributed among his friends, as the work of Lepidus, an ancient poet. The literati were completely deceived, and bestowed the highest applauses on a piece which they conceived to be a precious remnant of antiquity. It was written by him during the confinement of sickness, occasioned by too close an application to study, and appeared first about the year 1425, when the rage for ancient manuscripts was at its height, and Lepidus for a while took his rank with Plautus and Terence. Even in the following century, the younger Aldus Manutius having met with it in manuscript, and alike ignorant of its former appearance, and the purpose it was intended to serve, printed it at Lucca, 1588, as a precious remnant of antiquity. | Alberti took orders afterwards in order to have leisure to prosecute his studies. In 1447 he was a canon of the metropolitan church of Florence, and abb of St. Savino, or of St. Ermete of Pisa. Although he became known to the world as a scholar, a painter, a sculptor, and an architect, it is to his works of architecture that he owes his principal fame. He may be regarded as one of the restorers of that art, of which he understood both the theory and practice, and which he improved by his labours as well as his writings. Succeeding to Brunelleschi, he introduced more graceful forms in the art; but some consider him notwithstanding as inferior to that celebrated architect. Alberti studied very carefully the remains of ancient architecture, which he measured himself at Rome and other parts of Italy, and has left many excellent specimens of his talents. At Florence, he completed the Pitti palace, and built that of Ruccellai, and the chapel of the same family in the church of St. Pancras; the facade of the church of Santa Maria Novella, and the choir of the church of Nunziata. Being invited to Rome by Nicholas V. he was employed on the aqueduct of PAqua Vergine, and to raise the fountain, of Trevi; but this having since been reconstructed by Clement XII. from the designs of Nicholas Salvi, no traces of Alberti’s work remain. At Mantua, he constructed several buildings, by order of Louis of Gonzaga, of which the most distinguished are the churches of St. Sebastian, and that of St. Andrew: the latter, from the grandeur and beauty of its proportions, is esteemed a model for ecclesiastical structures. But his principal work is generally acknowledged to be the church of St. Francis at Rimini. 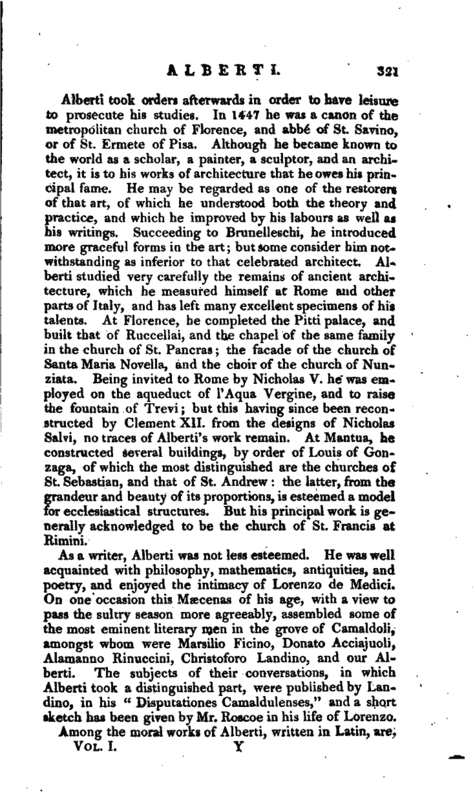 As a writer, Alberti was not less esteemed. He was well acquainted with philosophy, mathematics, antiquities, and poetry, and enjoyed the intimacy of Lorenzo de Medici. On one occasion this Meecenas of his age, with a view to pass the sultry season more agreeably, assembled some of the most eminent literary men in the grove of Camaldoli, amongst whom were Marsilio Ficino, Donato Acciajuoli, Alamanno Rinuccini, Christoforo Landino, and our Alberti. 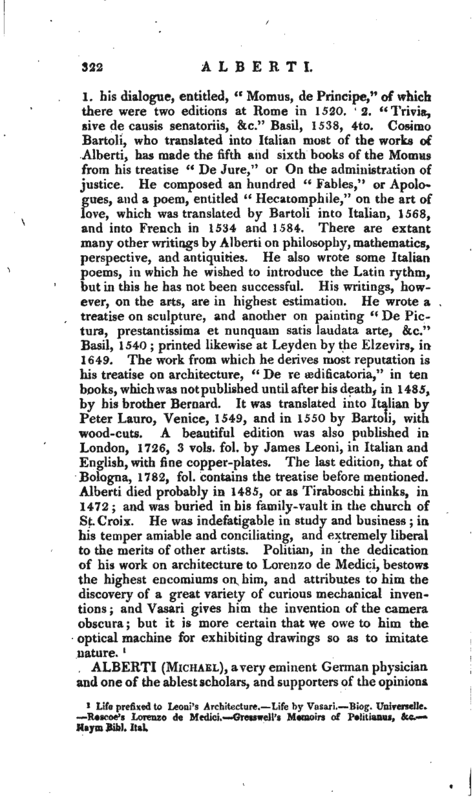 The subjects of their conversations, in which Alberti took a distinguished part, were published by Landino, in his “Disputationes Camaldulenses,” and a short sketch has been given by Mr. Roscoe in his life of Lorenzo. 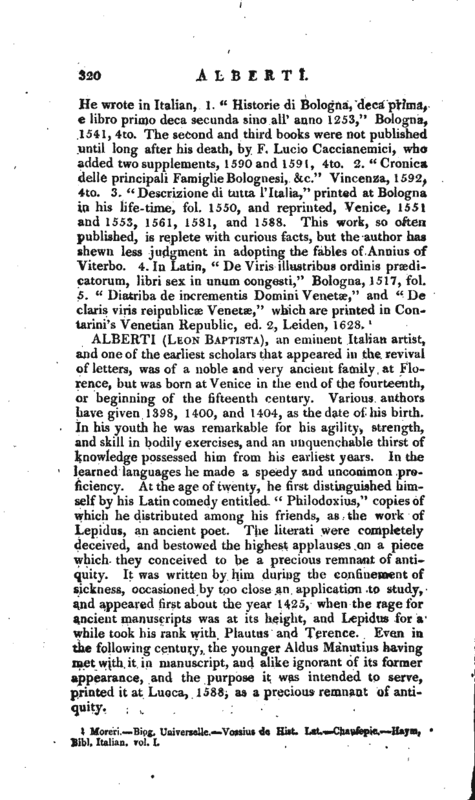 Life prefixed to Leoni’s Architecture.—Life by Vasari.—Biog. Universelle. —Roscoe’s Lorenzo de Medici.—Gresswell’s Mmoirs of Politianus, &c.— Haym Bibl. Ital.